I've read lots of self-help books and had hit my limit, so I had no desire to read this when I first heard about it. Honestly, it was only that I liked Brendon's energy in his videos combined with the particular offer (the book plus a 12 week video course for $7) that made me pull the trigger. And I loved it -- both the book and the video series. Critical reviews seem to focus on a lack of practical advice in the book. First, there is some solid advice, particularly some very pointed questions Brendon asks of the reader. If you're not willing to put the book down and write out answers to those questions, then yes, you'll get very little out of the book. Second, practical advice is NOT the main goal of the book. 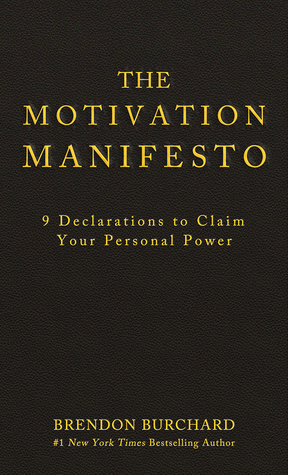 For once, this IS a book you can judge by its cover: The Motivation Manifesto. It's a "motivation manifesto" in that it's written in a very particular style designed to motivate the reader -- it uses rhetoric and poetic language to inspire and excite. And I for one found myself putting the book down quite often because I was so inspired to take action on some creative idea or inner calling. While there are whole chapters that feel like they're reaching, unnecessary, or over-written, I will concede that it might just be that those particular sections are not that relevant to me and my life right now; perhaps there are other readers who find them indispensable. Because the sections that ARE relevant to me feel deeply profound. I've created a document of 30+ questions from this book that I've answered and intend to revisit at least quarterly to help keep me on track with the life and business I want for myself and my clients. In summary: Despite its weak spots, this book has motivated me to take a deep and honest inventory of who I am and what choices I need to make to create a better life for myself and all those I love and serve.